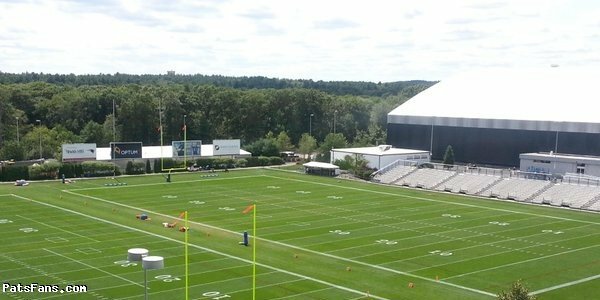 Good morning, here are Sunday’s New England Patriots news 7-17 notes and what’s happening around the AFC East. In a surprise move on Friday, Tom Brady capitulated to the NFL and will not be part of the NFLPA’s petition to the Supreme Court if indeed they continue the case. In opting to give in and accept his punishment, Brady will serve his four-game suspension. But make no mistake, Deflategate isn’t over. Brady’s portion of it is. He’ll sit out Weeks 1-4 in what has to be the most overblown league generated fiasco ever. So while the legion of Pats haters does a victory lap, the players association braces for the fight that is coming when the next CBA comes due in 2020. And you can bet there will be a work stoppage because the league and Roger Goodell are not going to give up the absolute power that he now holds over the players. And they, at least the smart ones know that he can suspend any of them whenever he wants because the courts say he has the power to do so. And evidence-smevidence… who cares about that. Goodell doesn’t need any. So Deflategate ISN’T over. No one knows what kind of strain Brady has gone thru for the past 18 months. But one can only imagine what a tough, roller coaster the past two seasons have been like. First dealing with the calls of he was done and no longer a top NFL QB. Then after catching fire and on the verge of returning to the Super Bowl, having your integrity and legacy called into play? And playing last season with a suspension looming over his head. So if he just got worn down by the entire fiasco and mentally couldn’t put up with any longer, then so be it. We don’t sit in his shoes and can’t imagine what it’s been like for him. We also heard that IF the Supreme Court agreed to hear his case, and a stay was issued that a ruling against him could impact him later in the season and even during the playoffs. While that scenario would be a nightmarish one for the Patriots 2016 season, it is exactly why he should have stayed in the fight. This is not only about the ridiculous 4-game suspension that Goodell levied, nor just about his legacy but about how this will effect NFLPA members down the road. Goodell’s power trip will affect many players down the road and this is an opportunity to fix that without going thru a work stoppage in the future. This case would be a benefit to all NFL players, present and future. Regardless of how difficult this fight wouldn’t have been to win; this was one that should have been seen thru to the end. You don’t just fight the fights you can win; you fight the fights that need fighting. He should have stuck it out. Did Kraft Blast the League or Did His Words Ring Hollow? After Brady announced his decision not to contest his suspension, Patriots owner Robert Kraft released a statement that seemed to put the hammer down on the league. Kraft called the sham investigation of Ted Wells, “flawed and biased from the start,” and said that Brady wasn’t given due process. Strong stuff. So it is difficult to compare those strong words with some of the confusing actions on his part. Because, as popular as he is as an owner, and he’s been the best this organization has ever seen, he’s played both sides of the fence. After coming out like gangbusters before the Super Bowl and demanding an apology, he went to the owners meeting and finding no support among the Jones, Rooneys, and Maras…who wanted their pound of flesh, he caved. He caved quicker than a paper house in a typhoon. In a statement, he meekly accepted the NFL’s punishment of losing two draft picks, a $1,000,000 fine and having his QB get socked with a 4-game suspension. He flipped-flopped again telling the media and fans that it was wrong for him to have put his trust in the league. But the pull of the billionaire boys club is strong and both he and Goodell have been seen schmoozing for the press on a number of occasions since. Now this latest statement after Brady’s decision doesn’t feel like the slam that fans and some of the media are saying it was. Those words are ringing a bit hollow. 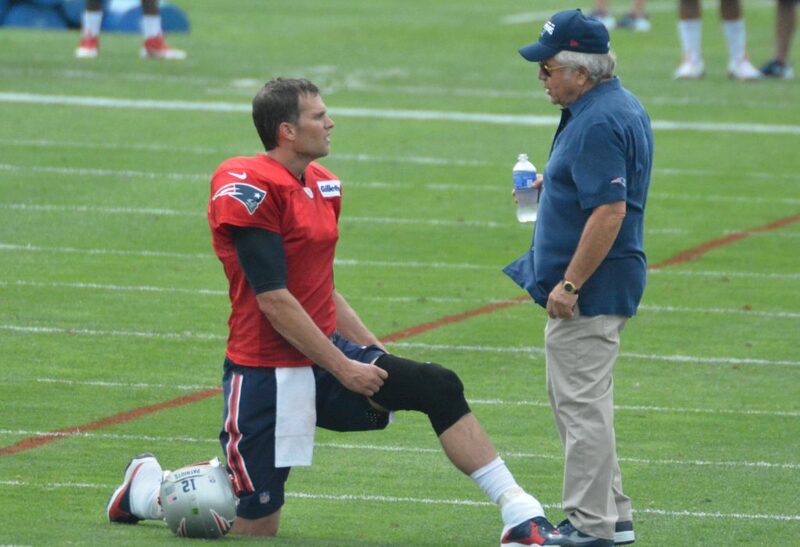 One has to wonder what Brady truly feels about all of this. We’ll probably never find out. Good luck to Nate Ebner who should find out his fate on if he makes the National Rugby team soon. The US National Team is expected to announce their roster tomorrow for the 2016 Summer Olympics. If Ebner makes the cut, he will be in Rio and take part in the Olympic tournament that begins on August 6. 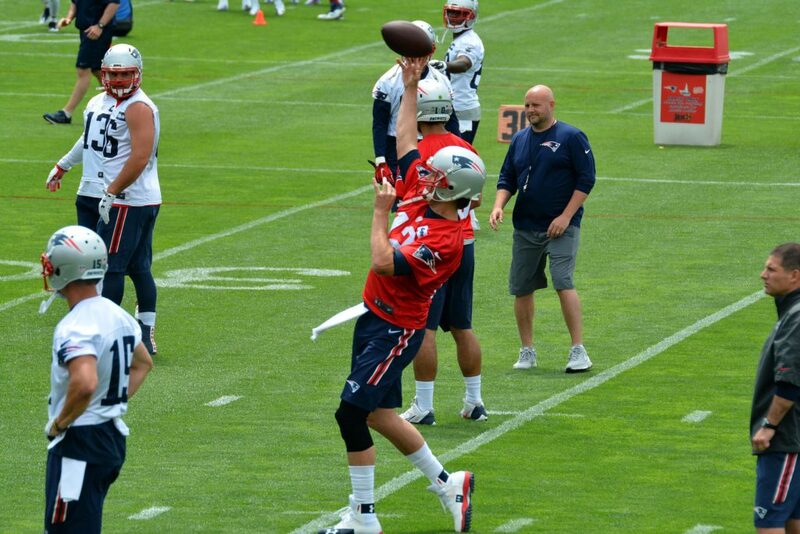 Be sure to keep checking PatsFans.com as training camp approaches. We are doing primers by position and we’ve already posted ones on the running backs, tight ends, and wide receivers. Be sure to check out our podcast “Patriots 4th and 2”. We’ve been doing a series of podcasts lately dealing with the Pats opponents in the AFC East and conducting a season preview of each team. We recently sat down with Dolphins beat writer Antwan Staley and took a look at Miami. Dolphins Landry, the New Face of Miami Sports? With the departure of Dwayne Wade from the Miami Heat via free agency, there is a void on who is the new face of sports in the city of Miami. Well, the Dolphins may just have an answer for that in the name of Jarvis Landry. And of course, Landry is an outstanding talent that we watch at least twice a year. If Landry keeps improving and plays like he’s expected to in 2016, he could easily be the new face of Miami sports. The Jets, to no one’s surprise, finally got a deal done with Muhammad Wilkerson their Pro Bowl DT. Wilkerson is one of the best DTs in the game and was rewarded with a 5-year deal worth $86 million dollars, with $37 million guaranteed in the first two years and $54 million guaranteed by year three. Shortly after trolling the Patriots with a silly meme on hearing the Tom Brady suspension news, the Bills got bad news of their own. Running back Karlos Williams will be suspended for the first four weeks of the season for violating the league’s substance-abuse policy. Williams is expected to take a heavier workload in 2016 to keep LeSean McCoy fresh and healthy this season. He scored nine touchdowns in 2015, tied for tops on the Bills. Now he’ll have to wait to make his first appearance until after the first New England game on October 2. He’s eligible to return to the team on October 3. And it compounds with the news of rookie running back Jonathan Williams being arrested for suspicion of DWI in Arkansas this week. He’s facing a two-game suspension but it probably wouldn’t be enforced until 2017. This entry was posted in Patriots Commentary, Patriots News and tagged 2016 Patriots Roster, 53 Man Roster Projection, Bill Belichick, Buffalo Bills, DeflateGate, Jarvis Landry, Jonathan Williams, Julian Edelman, Karlos Williams, Miami Dolphins, Muhammad Wilkerson, New England Patriots, New York Jets, NFL, Patriots, Rob Gronkowski, Ryan Fitzpatrick, Tom Brady on July 17, 2016 by Steve Balestrieri. This episode was a conversation with Jeff Capellini who is a columnist and an editor forCBSNewyork.com and WFAN.com. Jeff shared his thoughts on the New York Jets heading into Training Camp which arrives in just a few weeks. This entry was posted in Patriots Podcast and tagged Muhammad Wilkerson, New England Patriots, New York Jets, Sheldon Richardson, Todd Bowles on July 5, 2016 by Russ Goldman. The Patriots need just one more win to lock up the #1 seed and clinch home field advantage for the playoffs but they’ll have to travel down to the New Jersey Meadowlands and beat the New York Jets to do so. The Pats (12-2), dispatched the lowly Tennessee Titans 33-16 last week but are banged up with 17 players on IR and another 13 dealing with different types of injuries. This will be a tough playoff-like test for the Patriots. The Jets (9-5), are still very much in the playoff hunt but need to win both of their games and get some help as both the Chiefs and Steelers hold tiebreakers over them. The Jets enter on a roll having won four in a row. Steven Jackson: The Patriots newest running back hasn’t played in a year and questions remain on how much the talented back for the Rams and Falcons has left in the tank as well as how sharp he will be having just a few practices under his belt. Jackson is a big, powerful runner and a good receiver out of the backfield so the Patriots may opt to use him in the passing game on early downs as well. For a player who hasn’t been on the field for so long, ball security will be a key area to watch. We expect Jackson to get between 10-15 touches in the game and if he can give the Patriots some semblance of balance in this one it will take a ton of pressure off of Brady and the offensive line in trying to pass protect. Key stat: In the first meeting back in October the Patriots rushed only nine times for 16 yards on the day. Brady led the Patriots in rushing with 15 yards on four carries. The Jets allow an average of only 82 yards per game on the ground and have given up just two rushing touchdowns in 2015. Brandon Marshall: The talented Jets receiver was frustrated in the opening game between the two teams. The Patriots used cornerback Logan Ryan with over-the-top safety help to neutralize Marshall and he had one of his least productive games in 2015. Marshall also had two of his seven drops of the season in that game including a key drop in the end zone that would have increased the Jets lead to eight in the pivotal fourth quarter in the 30-23 loss. The plan was to get him the ball more often which resulted in Ryan Fitzpatrick having to look elsewhere in the passing game. Look for the Jets to move him around a bit more in this one and possibly put him in motion with some short crossing routes to get him involved more quickly this time around. Key Stat: Marshall had only four catches for 67 yards in the Week 7 matchup, for the Jets most prolific receiver with 93 catches for nearly 1300 yards and 11 touchdowns, that was a win for the Patriots defense. This time around will be a bigger test as Marshall looks for some payback. Tom Brady: In the first meeting in October, Brady with closer to a full-complement of weapons albeit with a banged up offensive line, eschewed the running game for the short passing game and completed 35 of 54 passes for 354 yards and two touchdowns in the comeback win. Brady will have to win this one without the services of both Julian Edelman (doubtful) and Danny Amendola (questionable), both of whom are key elements in the Patriots quick passing game. Brady will still have TE Rob Gronkowski who had a big game the first time around with 11 catches for 108 yards and a touchdown. But the Jets will put a premium on stopping him Sunday. Both he and James White will need to step up. Key Stat: Of Brady’s 19 incompletions the first game, 11 were drops including six by Brandon LaFell who was in his first action after missing all of the spring and summer. But in the pivotal 4th quarter with New England down by four, Brady was vintage; he hit on 14 of 17 for 150 yards and two touchdowns in the comeback win. Muhammad Wilkerson: The Jets big man in the defensive line is having an outstanding season. He’s been a force at stopping the run as well as rushing the passer. He’s due to hit free-agency in March and his stellar play in 2015 is adding up to dollar signs for 6’4, 315 defensive end. Normally facing a double team, Wilkerson is a tough man to account for in the running game. The Jets like to move him around a bit on the defensive line to find a mismatches in pass rushing situations and he’s a guy that can get after the opposing quarterback as he sacked Brady in the first matchup. Whoever lines up opposite Wilkerson is likely to have some help as he’s proven to be a player the Patriots will have to account for on every down. He has 12 sacks this season, a career high and will be looking to get even more on Sunday. Key Stat: Wilkerson has been very consistent this season notching sacks in seven of the Jets 14 games this season but his best game was perhaps against Tennessee where he sacked Titans QBs three times, had a pass defensed and forced a fumble. If the Jets get any kind of production like that on Sunday, things will be looking good for Gang Green’s defense. Malcolm Butler: The Patriots second-year corner has transformed from an undrafted free agent and part-time player as a rookie to the Patriots starting left corner. Butler was just named to the Pro Bowl this week in just his second season. The confidence that the coaching staff has shown in him is particularly telling; the team frequently leaves him out alone 1-on-1 with opponents best WRs. This week, he’ll probably draw the Jets Eric Decker and he’ll have to be on top of his game. Decker is the Jets second leading receiver with 72 catches for 930 yards and 10 touchdowns. But Jets coach Todd Bowles says that Butler is already one of the top corners in the league. Key Stat: In the first game Butler didn’t have one of his best games. The Jets were 5 for 11 for 82 yards when passing to Decker. But Butler was flagged three times; once for illegal use of hands, holding and an 18-yard pass interference penalty. He’ll be looking to improve on that performance this week. Ryan Fitzpatrick: The Jets much-traveled quarterback seems to have found a home in New York. Fitzpatrick has transformed himself into a solid starter and is having a career year. Fitzpatrick’s 26 passing touchdowns are just three shy of the Jets all-time single season record set by Vinnie Testaverde. During the Jets recent four-game winning streak, Fitzpatrick has been excellent, passing for 1229 yards, with 10 touchdown passes and only one interception. He’s been the catalyst to the Jets resurgent offense led by the passing game in the second half of the season. He may look to get RB Bilal Powell involved early in this game; Powell missed the first meeting with an ankle injury. Fitzpatrick has developed a nice chemistry with the mercurial Marshall who is in the Top 10 of NFL WRs in catches, yards and touchdowns. The Jets 1-2 tandem of Marshall and Decker lead the NFL with 21 touchdown receptions. It is no surprise that during the winning streak Fitzpatrick has hit Marshall frequently, he’s had three 100-yard games. Key Stat: Fitzpatrick passed for 295 yards in the first game between the two teams and was sacked just twice. The Jets have allowed only 20 sacks this season and Fitzpatrick has gone down just 17 times. The Patriots have 47 sacks on the season and have had at least one sack in the past 27 games, the longest current streak in the NFL. 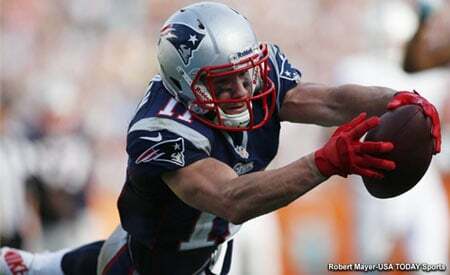 The key on Sunday will be for New England to get to him much more frequently than they did the first time. He’s playing at a level now where if he gets the time, he’ll find one of the plethora of talented receivers the Jets own. 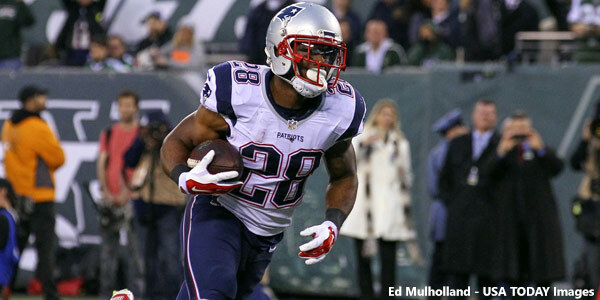 This entry was posted in Patriots Commentary, Patriots News and tagged 2015 NFL Season, Bilal Powell, Bill Belichick, Brandon LaFell, Brandon Marshall, Buffalo Bills, Chandler Jones, Chris Ivory, Danny Amendola, Dion Lewis, Eric Decker, Foxboro Stadium, Julian Edelman, LaGarrette Blount, Malcolm Butler, Muhammad Wilkerson, New England Patriots, New York Jets, NFL, Patriots, Rob Gronkowski, Ryan Fitzpatrick, Todd Bowles, Tom Brady on December 26, 2015 by Steve Balestrieri. 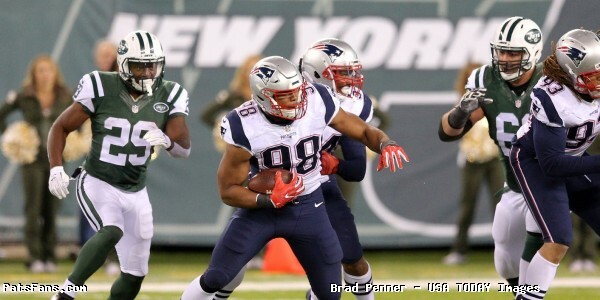 Patriots – Jets II, Key Matchups; Who Has the Razor’s Edge? 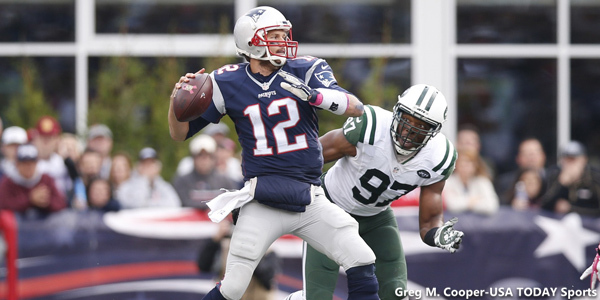 The New England Patriots head back out on the road for a key game against the New York Jets. The normal rivalry aside, this one is even bigger in terms of playoff implications for both teams. Kickoff is scheduled for 1:00 p.m. ET on Sunday and will have Ian Eagle and Dan Fouts on the call. The game can also be heard on the Patriots flagship station of 98.5 FM the Sports Hub with Bob Socci and Scott Zolak on the call. The Jets (9-5) are on a four-game winning streak and need to win to keep their playoff hopes alive. They are currently tied with both the Pittsburgh Steelers and Kansas City Chiefs at 9-5 but lose out on the tie breaker and are on the outside looking in. They beat the Dallas Cowboys 19-16 last week as they gutted out a close win in the final moments. New England (12-2), beat a bad Tennessee Titans team 33-16 on Sunday to clinch a first round bye in the playoffs. It was the Patriots sixth straight 12-win season becoming only the second team (Indy with seven) to do so. With a win on Sunday the Patriots will clinch the #1 seed in the AFC and ensure home field advantage in the playoffs. Series History: The Patriots and Jets will meet for the 114h time on Sunday including the playoffs. The Patriots hold a 59-53 overall edge against Gang Green but the series has been marked recently by very close games. The Jets maintain a 28-27 lead at home although the Patriots lead 3-2 in games at Met Life Stadium. 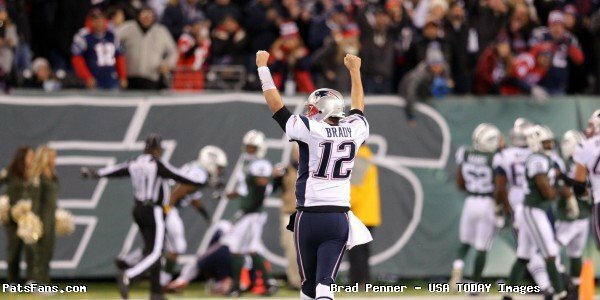 The most recent matchup was another classic Pats-Jets contest; New York led 20-16 in the fourth quarter before Tom Brady led the Patriots on two 10-play scoring drives for touchdowns in the Pats 30-23 win. This entry was posted in Patriots Commentary, Patriots News and tagged 2015 NFL Season, Bilal Powell, Bill Belichick, Brandon LaFell, Brandon Marshall, Buster Skrine, Calvin Pace, Chandler Jones, Chris Ivory, Danny Amendola, Darrelle Revis, Dion Lewis, Eric Decker, Jabaal Sheard, James White, Julian Edelman, LaGarrette Blount, Leonard Hankerson, Malcolm Butler, Muhammad Wilkerson, New England Patriots, New York Jets, NFL, Patriots, Patriots edge rushers, predictions, Rob Gronkowski, Rob Ninkovich, Ryan Fitzpatrick, Sheldon Richardson, Steven Jackson, Todd Bowles, Tom Brady on December 24, 2015 by Steve Balestrieri. The Patriots return to their Gillette Stadium home after a successful two week road trip that saw impressive wins over Dallas and Indianapolis that puts the team at 5-0. Now they face a familiar division rival the New York Jets. The Jets are off to a great start at 4-1 and fresh off a 34-20 thumping of the Washington Redskins. The rivalry with the Jets is always fierce regardless of either team’s record, with first place in the division on the line, even in Week 7 it will get ratcheted up a notch even more. As is typical with these games, a little bit of gamesmanship comes into play every time the two teams meet. 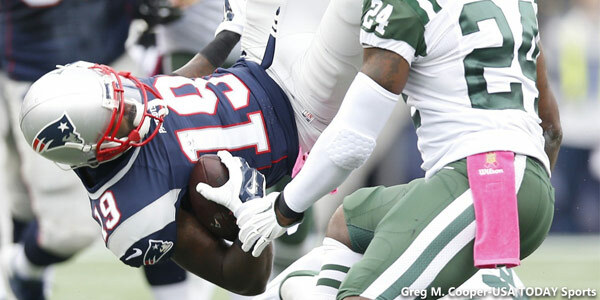 Just yesterday the Jets signed former Patriots wide receiver Kenbrell Thompkins to the active roster from the practice squad. Of course it could just be that they were filling a roster spot with WR Quincy Enunwa being suspended for four games for a domestic violence incident from a year ago. The game is scheduled for Sunday with the kickoff slated for 1 p.m. and will be televised by CBS. The game can be watched locally on WBZ-TV. Todd Bowles Exceeding Expectations Quickly: Bowles came highly regarded from the Arizona Cardinals and inherited a team in turmoil. The Jets had a ton of cash in salary cap space and won only four games in 2014. Most preseason projections had the Jets finishing again in the AFC East basement. But Bowles is much farther along in the rebuilding process and has the team already playing at a high level. Having already matched their win total of last season they now have their sights set on the champs and Bowles is an early front-runner for the coach of the year honors. Known as a defensive coach, he showed off some of his knowledge and in the meantime gave the Patriots something else to consider in the Jets win over Washington. Getting DL Sheldon Richardson back last week, questions were asked how Bowles would work him back into the rotation along the defensive line. Bowles scrapped his normal 3-4 base defense look and went to a more traditional 4-3 with Richardson and Damon Harrison at DT and impressive rookie Leonard Williams and Muhammad Wilkerson at DE. The move gave the Jets a tough unit for Washington to run on and they were able to disrupt the passing of QB Kirk Cousins. 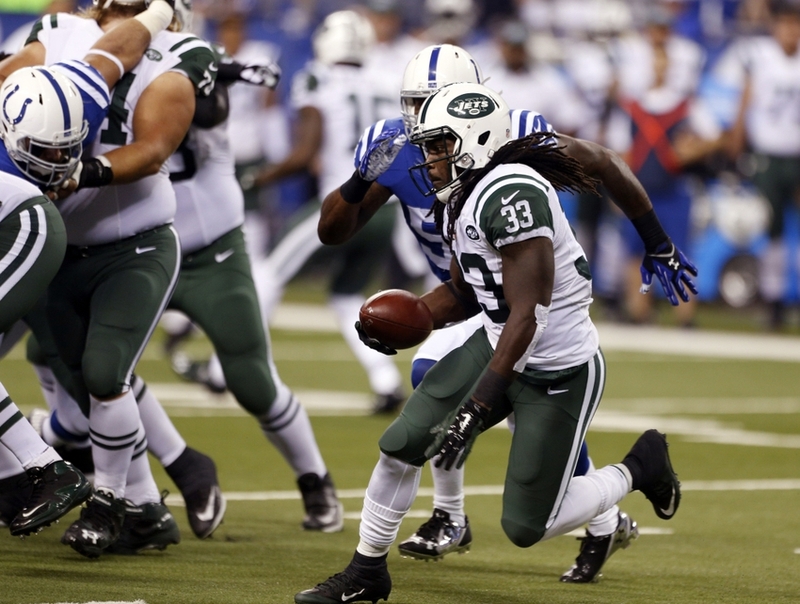 Chris Ivory Off to a Stellar Start to 2015: The Jets running back Chris Ivory, behind a better than advertised offensive line is off and running to start the season. Ivory ran for 146 yards against the Redskins and had 196 total yards from scrimmage. After having 166 yards rushing against Miami, his 312 rushing yards are the most by a Jets running back in two games since 2009. He’s averaging a very impressive 5.5 yards per carry. Ivory has given the Jets the balance that they need as offensive coordinator Chan Gailey has produced a nice mix of runs and passes by playing against an opponents’ weakness. The Jets only loss this season, against the Eagles was with Ivory on the sideline nursing a sore groin. In his four starts, he’s amassed 460 yards rushing with four touchdowns as well as his 5.5 yards per carry average. Revis Leads Revamped Jets Secondary: Much like he did in 2014 with the Patriots, Darrelle Revis is leading a re-tooled secondary again but this time for the Jets. The Jets secondary last year was a mess and new GM Mike Maccagnan wasted little time in bringing in the pieces to make it better. He signed Revis after the Pats declined on his $25 million dollar option, brought back Antonio Cromartie and signed slot corner Buster Skrine away from the Browns. The result is that the Jets now have the top defense in the league. Revis and Cromartie give the Jets excellent coverage on the perimeter and Skrine has been one of the best men at playing inside in the slot all season. Skrine was injured against the Redskins, suffering a concussion and will have to be cleared by the league’s protocols this week, but the Jets corners will present a tough test for Tom Brady and Co. Jets Offensive Line, A Big Test for NE: One of the big strengths of the Jets this season has been the surprising play of the Jets offensive line. While everyone knows they like to run the ball and be physical up front, they’ve also been remarkably adept at protecting QB Ryan Fitzpatrick, and this will be one of the matchups to watch this week as they go up against a re-tooled Patriots front seven. The Jets boast three first round draft picks on the OL with D’Brickashaw Ferguson, James Carpenter and Nick Mangold as well as Willie Colon and Breno Giacomini. And they’ve been playing lights out. Averaging 146 yards per game on the ground, the 2-3 yards they get in the first quarter turn into 8-10 late in the game as they wear down opponents. Plus, they’ve allowed a total of just two sacks of Fitzpatrick this season. Jets Wide Receivers Present Tough Challenge: The Jets needed to upgrade their wide receiver corps this off-season, and they have. Bringing in veteran Brandon Marshall, to complement Eric Decker, they have a potent 1-2 punch in the passing game on the outside. But they didn’t stop there, drafting speedster Devin Smith from Ohio State. Their return game is handled by Jeremy Kerley who adds to the depth of the passing game as well as Chris Oswusu. Unlike other seasons, Fitzpatrick as the Jets QB has a full complement of weapons at his disposal. Throw in tight ends, Jeff Cumberland and Kellen Davis and the offense has the capability of being a very tough one to stop. One area that they’re working on is the deep passing game, with opponents loading up the box to stop the run, Fitzpatrick would love to hit some deep throws to soften things up and make some big plays. This entry was posted in Patriots Commentary, Patriots News and tagged 2015 NFL Season, Antonio Cromartie, Buster Skrine, Chris Ivory, Darrelle Revis, Julian Edelman, Leonard Williams, Muhammad Wilkerson, New England Patriots, New York Jets, NFL, Patriots, Rob Gronkowski, Ryan Fitzpatrick, Sheldon Richardson, Todd Bowles, Tom Brady on October 20, 2015 by Steve Balestrieri.